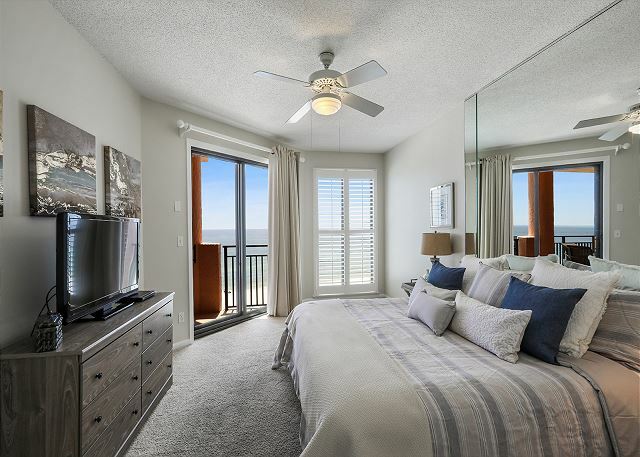 Stunning views of the Gulf from the living area and master bedroom as well as a large balcony. 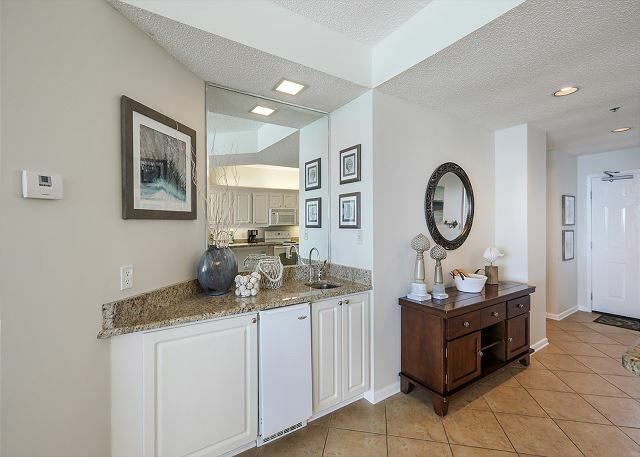 Updated furnishings with combination of tile and carpet make this 1,400 square foot, two bedroom, two bath eighth floor condominium a beach favorite. Living area has a comfortable queen sleeper sofa and brand new 50” flat screen TV as well as a Stereo CD player with I-Pod docking station. 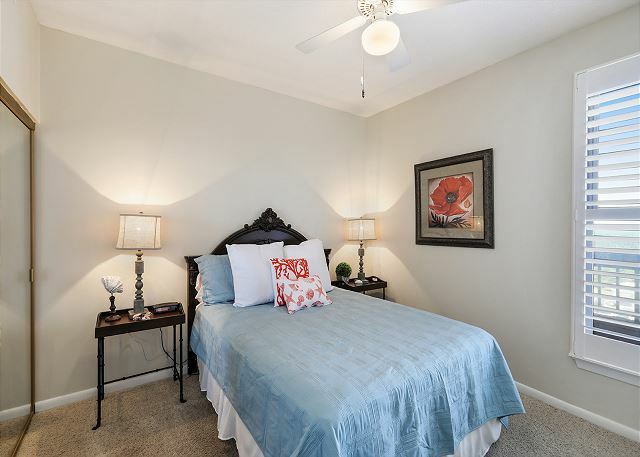 Master bedroom has a king size bed, 40” flat screen TV and sitting area overlooking the Gulf. The second bedroom has a queen size bed as well as 32” flat screen TV. DVD player in every room. There is also a rollaway for more flexibility with sleeping arrangements. This unit also has high speed Wi-Fi provided throughout for working or simply relaxing while you surf the internet. 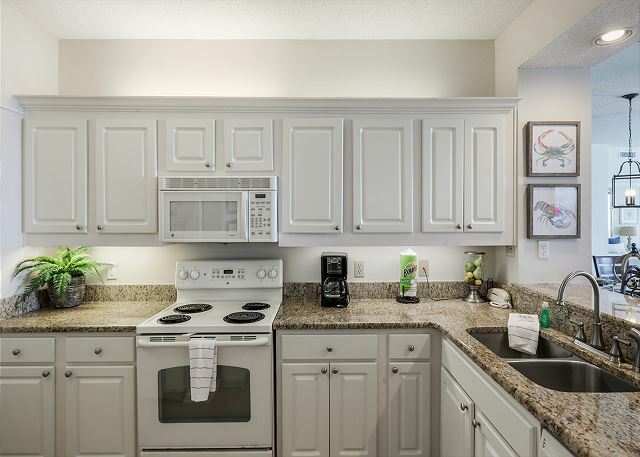 Fully appointed kitchen includes updated appliances, microwave, dishwasher and laundry area with full size washer and dryer. Enjoy the wet bar with full size ice maker. 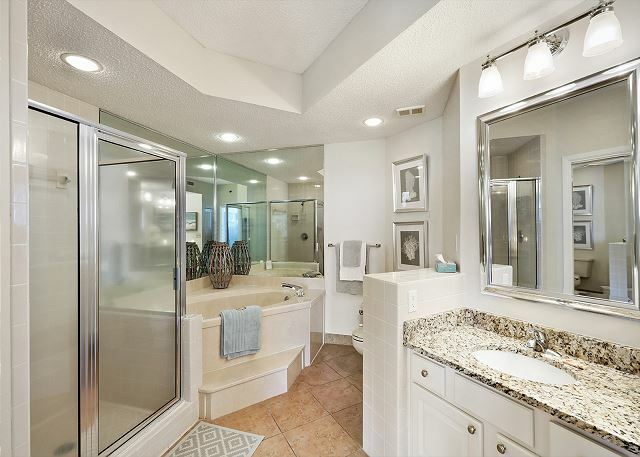 Other features include comfortably carpeted bedrooms, ceiling fans, central heating and air conditioning, and a large master bath with whirlpool tub, separate glass enclosed shower, double vanity and lots of closet space. Non-smoking. SeaChase is always a great experience. Wonderful staff, so clean, beautiful property. The unit was lovely and exactly how it was depicted in the pictures and descriptions! The refrigerator runs loudly at night and the guest toilet was running a bit but those are minor maintenance things! Thank you for choosing the Aronov Gulf Coast team for your SeaChase vacation! We're so glad you enjoyed your stay with us. We have forwarded your comments to the maintenance supervisor. Remember, you can request to come back to the same SeaChase condo again! We loved the condo! We made great family memories and look forward to coming again. Our family was very pleased with our accomodations at the Seachase this past summer. It had been a long time since we had been back to the Gulf Shores area. Karen in the Seachase office was very helpful with helping our family and another family find just the right condo for our vacation. The location of Seachase could not be any better. There was great access to grocery shopping and restaurants. I felt like the property was very secure and I felt safe each and every day that we were there. Our family will definitely be staying at the Seachase in the future. Upon our arrival the friendly security guard directed us to the guest office and gave us tips on parking during the completely booked week end. The office personnel were equally friendly and answered all our questions. The experience got better and better as we proceeded to our condo and saw the gorgeous view of the gulf and the perfectly appointed decor. Virtually every detail of the facility is well-thought out with the comfort and enjoyment of the guests in mind.Add beautiful weather throughout the week end and the picture is complete! Gracias por su respuesta. Estamos felices de que haya disfrutado de sus vacaciones y esperamos volver a verte pronto. SeaChase is a FANTASTIC property. 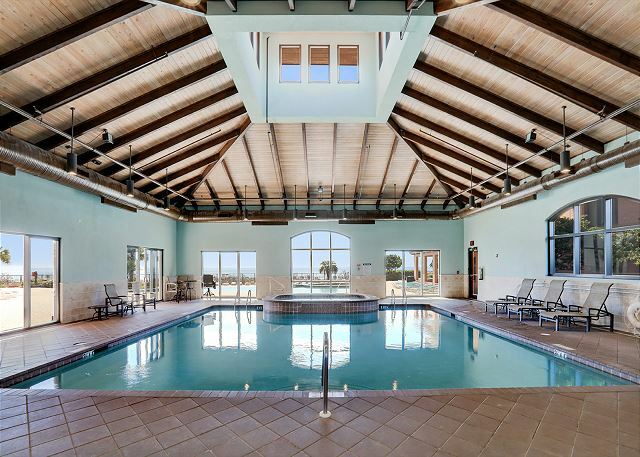 It has several pools and hot tubs. It is beautifully landscaped and decorated. 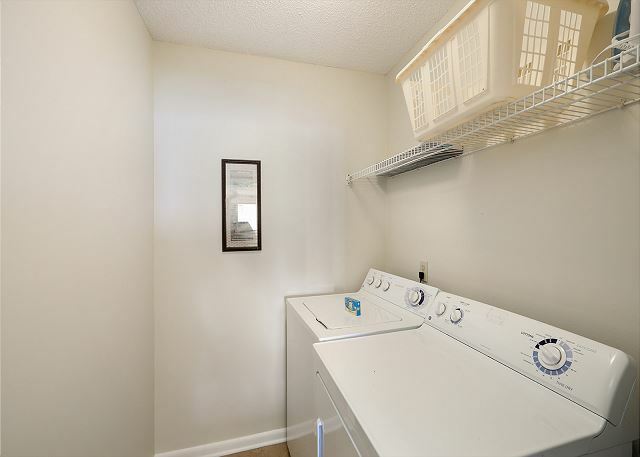 The condo unit, 803W, was a beautiful condo, which was well stocked for any need. Furniture was nice and unit was very clean. Our only complaint was the king size bed was rather hard and seemed old. Thank you for taking the time to provide feedback. We're so glad you enjoyed your stay with us and will forward your comments to the management staff and condo owner. We hope to see you at SeaChase again soon! I have stayed at Seachase for several years in a row. The property is wonderful and well kept up. The pool area is amazing. Anything you need is just across the street. This was our 6th trip to Orange Beach and Seachase. We don't want to stay anywhere else! Our family enjoyed our stay in this condo. It had an amazing view of the beach, and was in a great location. 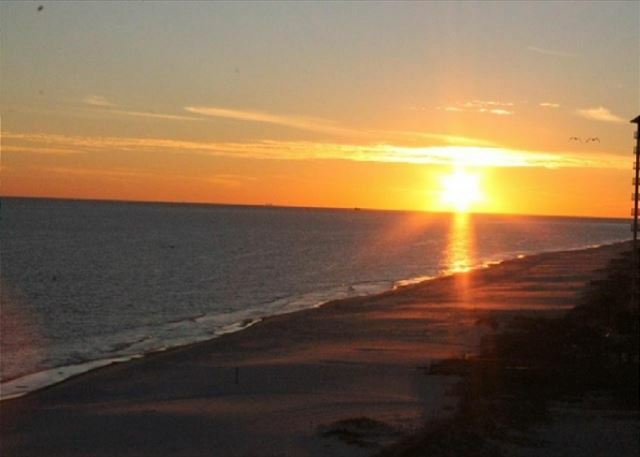 We were within easy driving distance to many of the great things in and around Orange Beach. The amenities were good. We would definitely come stay here again! We had a great vacation experience. We love staying at SeaChase. Our condo was very nice. My only complaint was that the bed in the master bedroom was a little hard. I also wish there was more parking in front of our unit. 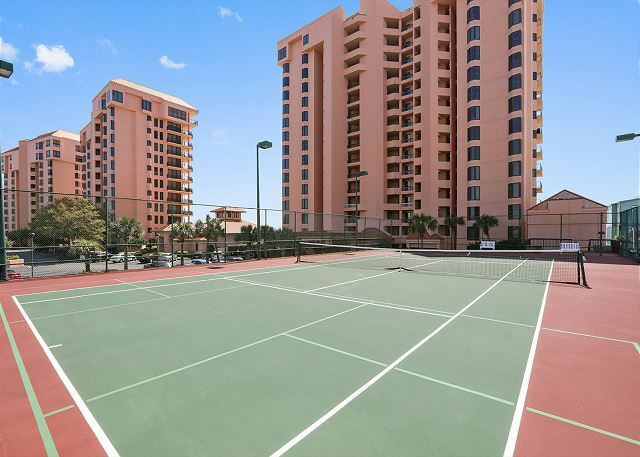 Very nice condo, clean and well maintained. Love the area, in the middle of everything. Carpets and rugs need to be cleaned as you could see the foot traffic. Couch and love seat were a bit uncomfortable as they have been well used. All mattresses are hard as a rock!! !